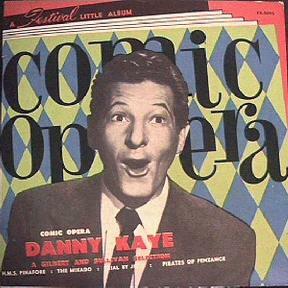 Danny Kaye (born David Daniel Kaminsky; January 18, 1913 – March 3, 1987) was an American actor, singer, dancer, and comedian. His performances featured physical comedy, idiosyncratic pantomimes, and rapid-fire nonsense songs. Kaye starred in 17 movies, notably The Kid from Brooklyn (1946), The Secret Life of Walter Mitty (1947), The Inspector General (1949), Hans Christian Andersen (1952), White Christmas (1954), and The Court Jester (1956). His films were popular, especially his bravura performances of patter songs and favorites such as “Inchworm” and “The Ugly Duckling.” He was the first ambassador-at-large of UNICEF in 1954 and received the French Legion of Honor in 1986 for his years of work with the organization. David Daniel Kaminsky was born to Ukrainian Jewish immigrants in Brooklyn. Jacob and Clara Nemerovsky Kaminsky and their two sons, Larry and Mac, left Yekaterinoslav two years before his birth; he was the only son born in the United States. He spent his early youth attending Public School 149 in East New York, Brooklyn—which eventually was renamed to honor him—where he began entertaining his classmates with songs and jokes, before moving to Thomas Jefferson High School, though he never graduated. His mother died when he was in his early teens. Clara enjoyed the impressions and humor of her son and always had words of encouragement; her death was a loss for the young Kaye. Not long after his mother’s death, Kaye and his friend Louis ran away to Florida. Kaye sang while Louis played the guitar; the pair eked out a living for a while. When Kaye returned to New York, his father did not pressure him to return to school or work, giving his son the chance to mature and discover his own abilities. Kaye said he had wanted to be a surgeon as a young boy, but there was no chance of the family affording a medical-school education. He held a succession of jobs after leaving school, as a soda jerk, insurance investigator, and office clerk. Most ended with his being fired. He lost the insurance job when he made an error that cost the insurance company $40,000. The dentist who hired him to look after his office at lunch hour did the same when he found Kaye using his drill on the office woodwork. He learned his trade in his teenage years in the Catskills as a tummler in the Borscht Belt, and for four seasons at the White Roe resort. 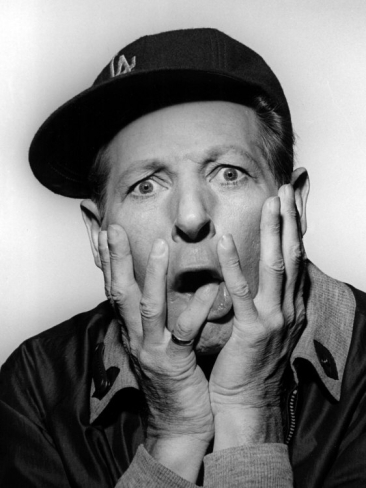 Kaye’s first break came in 1933 when he joined the “Three Terpsichoreans,” a vaudeville dance act. They opened in Utica, New York, with him using the name Danny Kaye for the first time. The act toured the United States, then performed in Asia with the show La Vie Paree. The troupe left for a six-month tour of the Far East on February 8, 1934. While they were in Osaka, Japan, a typhoon hit the city. The hotel where Kaye and his colleagues stayed suffered heavy damage; a piece of the hotel’s cornice was hurled into Kaye’s room by the strong wind, nearly killing him. By performance time that evening, the city was in the grip of the storm. There was no power, and the audience was restless and nervous. To calm them, Kaye went on stage, holding a flashlight to illuminate his face, and sang every song he could recall as loudly as he was able. The experience of trying to entertain audiences who did not speak English inspired him to the pantomime, gestures, songs, and facial expressions that eventually made his reputation. Sometimes it was necessary just to get a meal. Kaye’s daughter, Dena, tells a story her father related about being in a restaurant in China and trying to order chicken. Kaye flapped his arms and clucked, giving the waiter an imitation of a chicken. The waiter nodded in understanding, bringing Kaye two eggs. His interest in cooking began on the tour. When Kaye returned to the United States, jobs were in short supply and he struggled for bookings. One job was working in a burlesque revue with fan dancer Sally Rand. After the dancer dropped a fan while trying to chase away a fly, Kaye was hired to watch the fans so they were always held in front of her. Danny Kaye made his film debut in a 1935 comedy short Moon Over Manhattan. 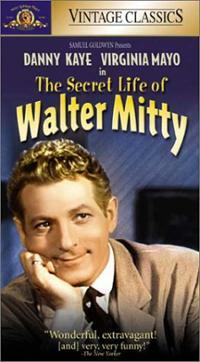 In 1937 he signed with New York–based Educational Pictures for a series of two-reel comedies. Kaye usually played a manic, dark-haired, fast-talking Russian in these low-budget shorts, opposite young hopefuls June Allyson or Imogene Coca. The Kaye series ended abruptly when the studio shut down in 1938. He was working in the Catskills in 1937, using the name Danny Kolbin. Kaye’s next venture was a short-lived Broadway show, with Sylvia Fine as the pianist, lyricist and composer. The Straw Hat Revue opened on September 29, 1939, and closed after ten weeks, but critics took notice of Kaye’s work. The reviews brought an offer for both Kaye and his bride, Sylvia, to work at La Martinique, a New York City nightclub. Kaye performed with Sylvia as his accompanist. At La Martinique, playwright Moss Hart saw Danny perform, which led to Hart casting him in his hit Broadway comedy Lady in the Dark. Kaye scored a triumph in 1941 in Lady in the Dark. His show-stopping number was “Tchaikovsky,” by Kurt Weill and Ira Gershwin, in which he sang the names of a string of Russian composers at breakneck speed, seemingly without taking a breath. In the next Broadway season, he was the star of a show about a young man who is drafted, called Let’s Face It!. His feature film debut was in producer Samuel Goldwyn’s Technicolor 1944 comedy Up in Arms, a remake of Goldwyn’s Eddie Cantor comedy Whoopee! (1930). Kaye’s rubber face and patter were a hit, and rival producer Robert M. Savini cashed in by compiling three of Kaye’s Educational Pictures shorts into a patchwork feature, The Birth of a Star (1945). Studio mogul Goldwyn wanted Kaye’s prominent nose fixed to look less Jewish, Kaye refused. He did allow his red hair to be dyed blonde, apparently because it looked better in Technicolor. 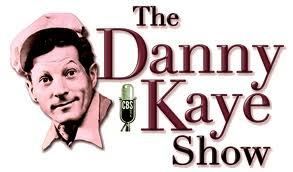 Kaye starred in a radio program, The Danny Kaye Show, on CBS in 1945–1946. The cast included Eve Arden, Lionel Stander and Big Band leader Harry James, and it was scripted by radio notable Goodman Ace and playwright-director Abe Burrows. The program’s popularity rose quickly. Before a year, he tied with Jimmy Durante for fifth place in the Radio Daily popularity poll. Kaye was asked to participate in a USO tour following the end of World War II. It meant he would be absent from his radio show for nearly two months at the beginning of the season. Kaye’s friends filled in, with a different guest host each week. Kaye was the first American actor to visit postwar Tokyo; He’d toured there some ten years before with the vaudeville troupe. When Kaye asked to be released from his radio contract in mid-1946, he agreed not to accept a regular radio show for one year and limited guest appearances on radio programs of others. Many of the show’s episodes survive today, notable for Kaye’s opening “signature” patter. • The 1946 Warner Bros. cartoon Book Revue had a sequence with Daffy Duck impersonating Kaye singing “Carolina in the Morning” with the Russian accent that Kaye affected from time to time. • Satirical songwriter Tom Lehrer’s 1953 song “Lobachevsky” was based on a number that Kaye had done, about the Russian director Constantin Stanislavski, with the affected Russian accent. 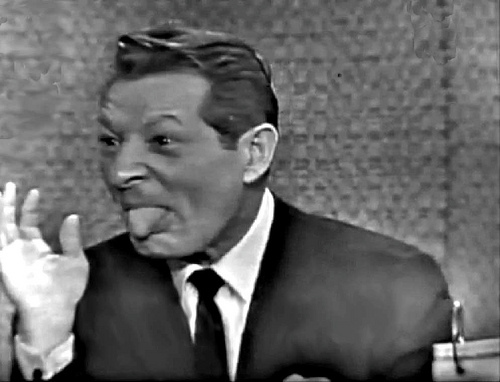 Lehrer mentioned Kaye in an opening monologue, citing him as an “idol since childbirth”. • Superman creators Jerry Siegel and Joe Shuster fashioned a short-lived superhero title, Funnyman, taking inspiration from Kaye’s persona. Kaye starred in several movies with actress Virginia Mayo in the 1940s, and is known for films such as The Secret Life of Walter Mitty (1947), The Inspector General (1949), On the Riviera (1951) co-starring Gene Tierney, Knock on Wood (1954), White Christmas (1954, in a role intended for Fred Astaire, then Donald O’Connor), The Court Jester (1956), and Merry Andrew (1958). Kaye starred in two pictures based on biographies, Hans Christian Andersen (1952) the Danish storyteller, and The Five Pennies (1959) about jazz pioneer Red Nichols. His wife, writer/lyricist Sylvia Fine, wrote many tongue-twisting songs Danny Kaye was famous for. She was an associate producer. 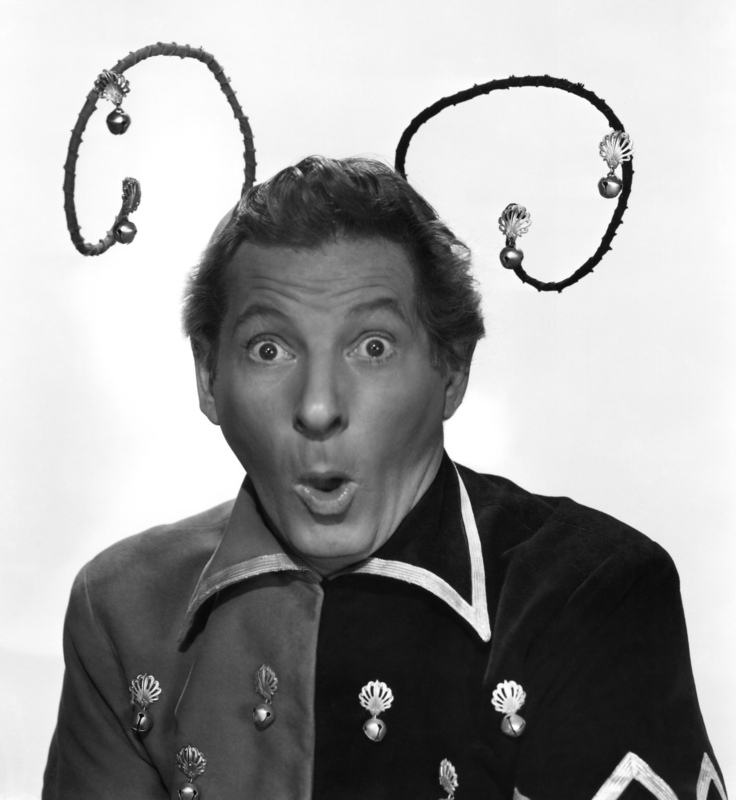 Some of Kaye’s films included the theme of doubles, two people who look identical (both Danny Kaye) being mistaken for each other, to comic effect. He doesn’t have any first name. Even his wife calls him just Kaplan. He’s an illiterate pompous character who advertises his philanthropies. Jack Benny or Dore Schary might say, “Kaplan, why do you hate unions so?” If Danny feels like doing Kaplan that night, he might be off on Kaplan for two hours. He hosted the 24th Academy Awards in 1952. The program was broadcast on radio. Telecasts of the Oscar ceremony came later. During the 1950s, Kaye visited Australia, where he played “Buttons” in a production of Cinderella in Sydney. In 1953, Kaye started a production company, Dena Pictures, named for his daughter. Knock on Wood was the first film produced by his firm. The firm expanded into television in 1960 under the name Belmont Television. Kaye entered television in 1956 on the CBS show See It Now with Edward R. Murrow. 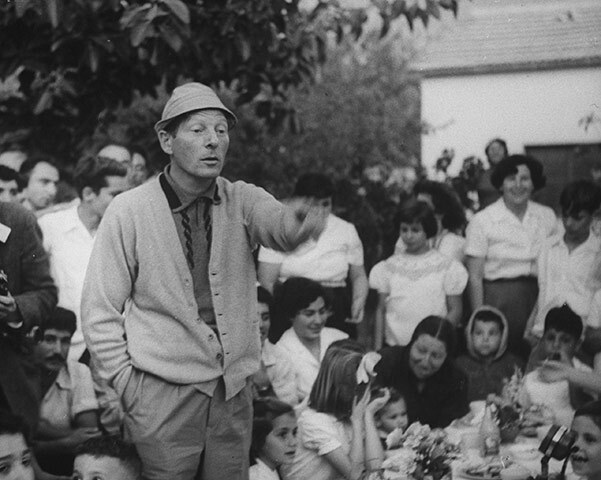 The Secret Life of Danny Kaye combined his 50,000-mile, ten-country tour as UNICEF ambassador with music and humor. His first solo effort was in 1960 with an hour special produced by Sylvia and sponsored by General Motors; with similar specials in 1961 and 1962. 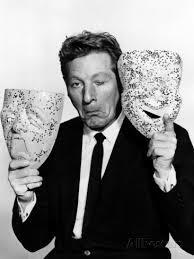 He hosted a variety hour on CBS television, The Danny Kaye Show, from 1963 to 1967, which won four Emmy awards and a Peabody award. Beginning in 1964, he acted as television host to the CBS telecasts of MGM’s The Wizard of Oz. Kaye did a stint as a What’s My Line? Mystery Guest on the Sunday night CBS-TV quiz program. Kaye was later a guest panelist on that show. He also appeared on the NBC interview program Here’s Hollywood. In the 1970s, Kaye tore a ligament in his leg in the run of the Richard Rodgers musical Two by Two, but went on with the show, appearing with his leg in a cast and cavorting on stage in a wheelchair. He had done much the same on his television show in 1964 when his right leg and foot were burned from a cooking accident. Camera shots were planned so television viewers did not see Kaye in his wheelchair. In 1976, he played Mister Geppetto in a television musical adaptation of The Adventures of Pinocchio with Sandy Duncan in the title role. Kaye portrayed Captain Hook opposite Mia Farrow in a musical version of Peter Pan featuring songs by Anthony Newley and Leslie Bricusse. It was shown on NBC-TV in December 1976, the Hallmark Hall of Fame series. He later guest-starred in episodes of The Muppet Show, The Cosby Show and in the 1980s revival of The Twilight Zone. In many films, as well as on stage, Kaye proved to be an able actor, singer, dancer and comedian. He showed his serious side as Ambassador for UNICEF and in his dramatic role in the memorable TV film Skokie, when he played a Holocaust survivor. Before his death in 1987, Kaye conducted an orchestra during a comical series of concerts organized for UNICEF fundraising. Kaye received two Academy Awards: an Academy Honorary Award in 1955 and the Jean Hersholt Humanitarian Award in 1982. Also that year he received the Screen Actors Guild Annual Award. Kaye was enamored of music. While he claimed an inability to read music, he was said to have perfect pitch. Kaye’s ability with an orchestra was mentioned by Dmitri Mitropoulos, then conductor of the New York Philharmonic Orchestra. After Kaye’s appearance, Mitropoulos remarked, “Here is a man who is not musically trained, who cannot even read music, and he gets more out of my orchestra than I have.” Kaye was invited to conduct symphonies as charity fundraisers and was the conductor of the all-city marching band at the season opener of the Los Angeles Dodgers in 1984. Over his career he raised over US $5,000,000 in support of musician pension funds. In 1980, Kaye hosted and sang in the 25th Anniversary of Disneyland celebration, and hosted the opening celebration for Epcot in 1982 (EPCOT Center at the time), both were aired on prime-time American television. In his later years he entertained at home as chef—he had a special stove on his patio – and specialized in Chinese and Italian cooking. The stove Kaye used for his Chinese dishes was fitted with metal rings for the burners to allow the heat to be highly concentrated. Kaye installed a trough with circulating ice water to use the burners. Kaye taught Chinese cooking classes at a San Francisco Chinese restaurant in the 1970s. The theater and demonstration kitchen under the library at the Culinary Institute of America in Hyde Park, New York is named for him. Kaye referred to his kitchen as “Ying’s Thing.” While filming The Madwoman of Chaillot in France, he phoned home to ask his family if they would like to eat at “Ying’s Thing” that evening; Kaye flew home for dinner. Not all of his efforts in the kitchen went well. After flying to San Francisco for a recipe for sourdough bread, he came home and spent hours preparing loaves. When his daughter asked about the bread, Kaye hit the bread on the kitchen table. His bread was hard enough to chip it. Kaye approached his kitchen work with enthusiasm, making sausages and other foods needed for his cuisine. His work as a chef earned him the “Les Meilleurs Ouvriers de France” culinary award; Kaye was the only non-professional to achieve this honor. Kaye was an aviation enthusiast. He became interested in learning to fly in 1959. An enthusiastic and accomplished golfer, he gave up golf in favor of flying. When Kaye went for his written pilot’s exam, he brought a liverwurst sandwich in case he was there for hours. The first plane Kaye owned was a Piper Aztec. Kaye received his first license as a private pilot of multi-engine aircraft, not being certified for operating a single engine plane until six years later. He was an accomplished pilot, rated for airplanes ranging from single-engine light aircraft to multi-engine jets. Kaye held a commercial pilot’s license and had flown every type of aircraft except military planes. A vice-president of Learjet, Kaye owned and operated a Learjet 24. He supported many flying projects. In 1968, he was Honorary Chairman of the Las Vegas International Exposition of Flight, a show that utilized many facets of the city’s entertainment industry while presenting an air show. The operational show chairman was well-known aviation figure Lynn Garrison. Kaye flew his plane to 65 cities in five days on a mission to help UNICEF. 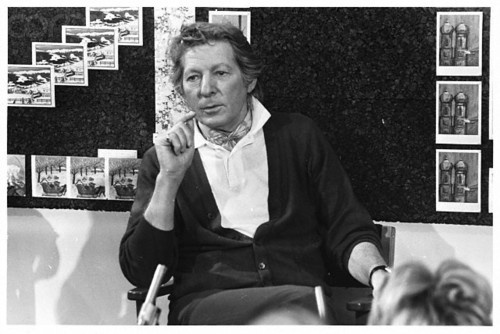 Danny Kaye was fond of the legendary arranger Vic Schoen. Schoen had arranged for him on White Christmas, The Court Jester, and albums and concerts with the Andrews Sisters. In the 1960s, Vic Schoen was working on a show in Las Vegas with Shirley Temple. He was injured in a car accident. When Danny Kaye heard about the accident, he flew to McCarran Airport to pick up Schoen and bring him to Los Angeles for medical attention. Kaye was part owner of baseball’s Seattle Mariners with Lester Smith from 1977 to 1981. Prior to that, the lifelong fan of the Brooklyn/Los Angeles Dodgers recorded a song called “The D-O-D-G-E-R-S Song (Oh really? No, O’Malley! )”, describing a fictitious encounter with the San Francisco Giants, a hit during the real-life pennant chase of 1962. That song is included on Baseball’s Greatest Hits compact discs. A good friend of Leo Durocher, he often traveled with the team. In addition to being an owner, Kaye had an encyclopedic knowledge of the game. Throughout his life, Kaye donated to charities. Working alongside UNICEF’s Halloween fundraiser founder, Ward Simon Kimball Jr., the actor educated the public on impoverished children in deplorable living conditions overseas and assisted in the distribution of donated goods and funds. His involvement with UNICEF came about in an unusual way. Kaye was flying home from London in 1949 when one of the plane’s four engines lost its propeller and caught fire. The problem was initially thought serious enough that it might make an ocean landing; life jackets and life rafts were made ready. The plane was able to head back over 500 miles to land at Shannon Airport, Ireland. On the way back to Shannon, the head of the Children’s Fund, Maurice Pate, had the seat next to Danny Kaye and spoke at length about the need for recognition for the Fund. Their discussion continued on the flight from Shannon to New York; it was the beginning of the actor’s long association with UNICEF. Kaye died of heart failure on March 3, 1987, brought on by internal bleeding and complications of hepatitis. Kaye had quadruple bypass heart surgery in February 1983; he contracted hepatitis from a blood transfusion. He left a widow, Sylvia Fine, and a daughter, Dena. His ashes are interred in Kensico Cemetery in Valhalla, New York. His grave is adorned with a bench that contains friezes of a baseball and bat, an aircraft, a piano, a flowerpot, musical notes, and a chef’s toque. Kaye’s name, birth and death dates are inscribed on the toque. The United Nations held a memorial tribute to him at their New York headquarters on the evening of October 21, 1987. Kaye and Sylvia Fine grew up in Brooklyn, living a few blocks apart, but they did not meet until they were working on an off-Broadway show in 1939. Sylvia was an audition pianist. Sylvia discovered that Danny had worked for her father, dentist Samuel Fine. Kaye, working in Florida, proposed on the telephone; the couple were married in Fort Lauderdale on January 3, 1940. Their daughter, Dena, was born on December 17, 1946. Kaye and his wife raised their daughter without parental hopes or aspirations for her future. Kaye said in a 1954 interview, “Whatever she wants to be she will be without interference from her mother nor from me.” When she was very young, Dena did not like seeing her father perform because she did not understand that people were supposed to laugh at what he did. On January 18, 2013, during a 24-hour salute to Kaye on Turner Classic Movies in celebration of his 100th birthday, Kaye’s daughter Dena revealed to TCM host Ben Mankiewicz that Kaye was born in 1911. After Kaye and his wife became estranged, circa 1947, he was allegedly involved with a succession of women, though he and Fine never divorced. The best known of these women was actress Eve Arden.